In Library of Dust, David Maisel continues to investigate a zone bordered by aesthetics and ethics. 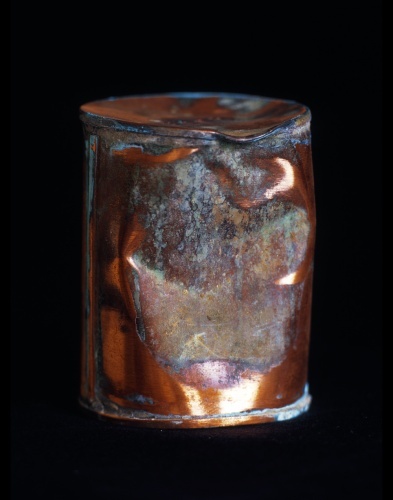 Library of Dust depicts individual copper canisters, each containing the cremated remains of a psychiatric patient from Oregon State Hospital. The hospital first revealed the existence of these 3500 canisters several years ago. The copper urns have a handmade quality, and corrosion blooms from the leaden seams and across the surfaces of many of the cans. The vestiges of paper labels with the names of the dead, the etching of the copper, and the intensely hued mineral encrustations have combined to individuate the canisters. Library of Dust offers a kind of resurrection of these individuals by giving them visual form once again.